Florida U.S. Sen. Marco Rubio been talking up his own version of the DREAM Act, which, unlike to the original, would not provide a path to permanent residency or citizenship. President Obama’s people can insist all they want that his recent move to direct Homeland Security to defer deportation for DREAMers — young undocumented people who had no say in being brought to this country by their parents — is not political, but, frankly, that’s pure crap. In fact, it’s about as political a move as Obama has made since he’s been in the White House. On March 28 of last year, the president himself rejected the idea that he could do exactly what he just did. And when the DREAM Act failed in the senate about a month later, the White House expressed disappointment in a statement that again suggested the president’s hands were tied: Obama “cannot unilaterally change the law,” it said. But in fact, this president has been issuing executive orders left and right — in no small part because it has been the only way to get around a Congress determined to stymie his agenda at every turn. So why, since Obama has been handy with the pen, did he wait three and a half years into his term to do this? Why, when hometown Congressman Luis Gutierrez — hands down the most knowledgeable guy the Democrats have on immigration — has been practically begging him to do this, did the president wait until five months before the election? Because he needed to do something fast before Republicans stole his thunder on immigration. Not that there was much thunder to steal. Obama, in spite of big promises of immigration reform during his campaign, has done very little on this front while racking up record numbers of deportations and — just to make the backlog truly horrendous — vacancies on immigration judgeships (and not each and every one of those can be blamed on the GOP). And those judge vacancies make what is already a traumatic experience even worse because deportation hearing waits under Obama have frequently exceeded 600 days — in other words, some people have been waiting in detention centers for almost two years to get deported. Obama moved now because Florida’s junior senator, Marco Rubio, was about to move. For months, Rubio has been talking up his own version of the DREAM Act — frequently referred to as the DREAM Act Lite because, unlike to the original, it would not provide a path to permanent residency or citizenship. To be clear, Rubio’s interest in immigration is an election year revelation. In all the time he spent in the Florida legislature, he didn’t give a whit about immigrants and frequently — and, as it turns out technically erroneously — he made a point of differentiating between immigrants and exiles, suggesting a particular cachet to exiledom lacking in mere immigration. 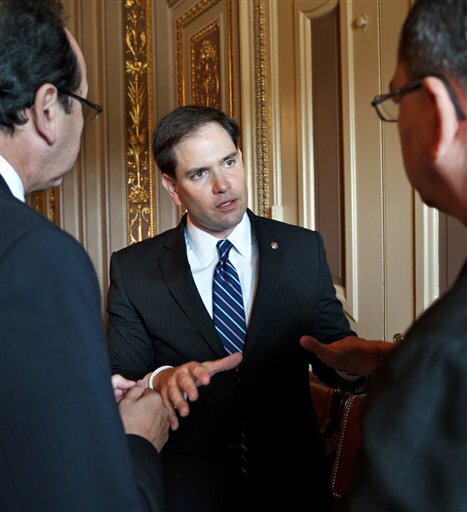 Consider Obama’s DREAM Act executive order an ambitious/survival move to counteract Rubio’s own ambitious/survival move. Which is why Obama’s timing was perfect: He essentially co-opted Rubio’s basic idea of non-deportation without residency or citizenship, making it so that Rubio is now forced to reconsider any legislation he might introduce. What would be the point of sending something up that does basically the same thing as the president’s order? In fact, Obama’s move was probably less about appeasing furious Latinos and putting a stop to embarrassing Hispanic student sit-ins at his campaign offices (not what you’d call a great photo-op), than making sure Rubio didn’t introduce his bill. If he had, he might have actually passed it — there are just enough Democrats whose own survival depends on the Latino votes in their states that they’d be hard pressed not to vote for any version of the bill. And given that the House, in GOP control, has already passed a version of the bill, it would not have been inconceivable to see Rubio’s bill become law. And that would have been one huge kick in the pants to Obama in swing states like Colorado, Nevada and Arizona. Political? This has been super political — on all sides. Absolutely political.